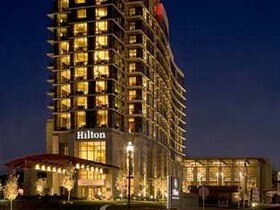 The Hilton Convention Center Hotel embraces the rustic natural Ozarks beauty in its recently refreshed decor, and beautifully combines it with the elegance you’ve come to expect from the Hilton name, and from all Branson hotels. The AAA Four Diamond Branson “Hilton” enjoys wonderful views of Lake Taneycomo and the rolling Ozarks’ hills, and features a long list of high end amenities. The Level 2 Steakhouse in the Hilton is a favorite among Branson area locals with its unique menu that includes many items made from locally sourced ingredients. You’ll also find a lively cocktail lounge, Clear, located on the lobby level. Other amenities include both indoor and outdoor pools, 24 hour fitness center with free weights and cardio machines with personal televisions, and a well-equipped, 24 hour business center, complete with computers, copier, and fax machine. The gorgeous outdoor pool oasis features comfortable, oversized seating, a fire pit, and private poolside cabanas, and the indoor pool has an adjacent whirlpool. There’s a variety of stylish and contemporary rooms, including expansive suites and condos. Not only is it one of the best of the Branson hotels, but the Hilton’s attached convention center boasts 220,000 square feet of flexible meeting space. This includes a 23,000 square foot ballroom, an audio/visual service provider, and up to 17 meeting spaces. Several flexible meeting rooms lie adjacent to an expansive hallway where guests can view the Branson Scenic Railway as it leaves or approaches the historic depot; the perfect space for receptions or registration areas. With a convenient location in historic downtown Branson, the attached flexible meeting and convention space, and the vibrant waterfront shopping, dining, and entertainment district known as Branson Landing right across the street, the Hilton Convention Center Hotel is the perfect choice for business travelers, vacationing couples, and families looking for an incredible lodging experience! If you want to find out more about Branson hotels, take a look at the lodging and vacation package options at Branson.com.